Puppet shows in Los Angeles that come to you! Moodoo Puppets brings a unique and extraordinary puppet show to your birthday party, festival or event. 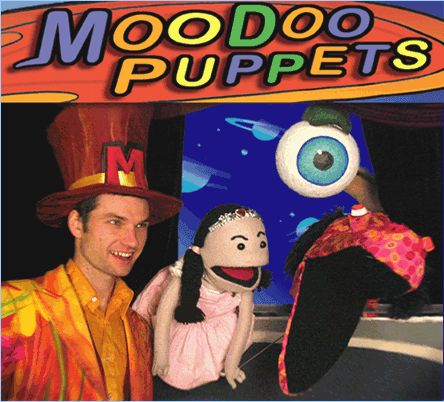 Moodoo Puppets brings a unique and extraordinary puppet show to your birthday party, festival or event. Live puppet shows - Los Angeles, San Gabriel Valley, San Fernando Valley, and Westside. Birthday Party Show - Your child becomes the hero! "Best Party Entertainers! After the show, my kids said, "This is the best birthday party ever!" Kids and parents will be entertained. Expect lots of smiles and laughter." "Best birthday party entertainment! Unique, original hand-made puppet characters from outer space and shows that capture the audience from start to finish. Very fun and interactive. Highly recommended." "Martina’s Undersea Adventure was a big hit at my daughter’s first birthday party. Kids aged 1-9 were completely entertained. The children were engaged the entire show and loved it as evidenced by their laughter and spontaneous interaction with the puppets during and after the show. I highly recommend Moodoo Puppets for any party. An added bonus- Moodoo Puppets was so easy to deal with. The company is professional, courteous and incredibly efficient. They returned all my calls and corresponded with me by email in a timely fashion. . . and arrived and set up right on time! I hope to make their appearance an annual event in our home." "Thanks again to the guys for a wonderful puppet show! The kids were absolutely captivated. [Our daughter] India still talks about it." "Thanks again for the puppet show. It was great—the kids loved it! So did the parents. Our staff members thought it was terrific too, and liked your show even better than the entertainment we got last year! Many thanks! Also a big thanks for the photo opps. after the show -- The children will love their pictures with the puppets!" •How long is the puppet show? 30 minutes. •Can the show go longer? Yes. Sometimes up to 45 minutes. •How much space do you need? We need a flat area that measures about 10' by 6'. •What is the set-up time? 10-15 minutes. •Do you do outdoor puppet shows? Yes. During hot Summer days, we need a shaded performance / audience area. •How silly are your shows? Very, very silly. Yes. As educators and parents, we encourage strong values such as honesty, sharing, and friendship. Kidspace Children's Museum, Barnhart School, Willard Children Center, Playfactory Pre-school, Park La Brea Children's Festival of the Arts, Hermosa Beach Community Center Puppet Theatre, Westside Pavilion Mall, Stonewood Center Mall, Montebello Town Center Mall, Los Cerritos Center Mall, and many more! Holiday show: "Martina and the Christmas Comet"
What are people saying about Moodoo Puppets? "It was the perfect beginning to our family holiday party. Many thanks Michael!" What happens after the show? After the show it's time to "meet the puppets". This is a special opportunity for kids to interact with their favorite Moodoo Puppets characters. • How long is the puppet show? • Can the show go longer? Yes. Sometimes up to 45 minutes. We need a flat area that measures about 10' by 6'. • What is the set-up time? • Do you do outdoor puppet shows? Yes. During hot Summer days, we need a shaded performance / audience area. • How silly are your shows? • What is the recommended age range? All ages. Lots of fun for parents, too! • Can my child interact with the puppets? • Are there morals in your stories? • Where have you performed? "It was the perfect beginning to our family holiday party. Many thanks, Michael!" After the show it's time to "meet the puppets" -- A special opportunity for kids to interact with their favorite Moodoo Puppets characters. "Thanks to my family and to all Moodoo Puppets supporters and fans for helping us bring joyful, imaginative and original puppetry to Los Angeles!"